The Absecon Lighthouse is a coastal lighthouse located in the north end of Atlantic City, New Jersey, overlooking Absecon Inlet. 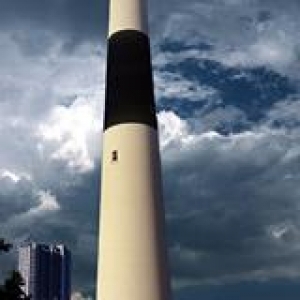 At it is the tallest lighthouse in the state of New Jersey and is the third-tallest masonry lighthouse in the United States. Construction began in 1854, with the light first lit on January 15, 1857. The lighthouse was deactivated in 1933 and although the light still shines every night, it is no longer an active navigational aid. The lighthouse is open to public visitation and for a small donation one may climb to the watch room and external gallery. A re-creation of the keepers' quarters was opened in 2002 and serves as a museum and gift shop. The original oil house now contains a Fresnel lens exhibit. Along with school and group tours, the Absecon Lighthouse also offers an overnight program for Scouts, winter arts program for children and a wide variety of special events throughout the year.